mSheet™ - you'll never look at the market the same way again. It's a unique new analysis tool that does lightning fast calculations derived from your own live market charts. Put an easy spreadsheet-like face on your most complex calculations -- or just use it to create a watchlist. 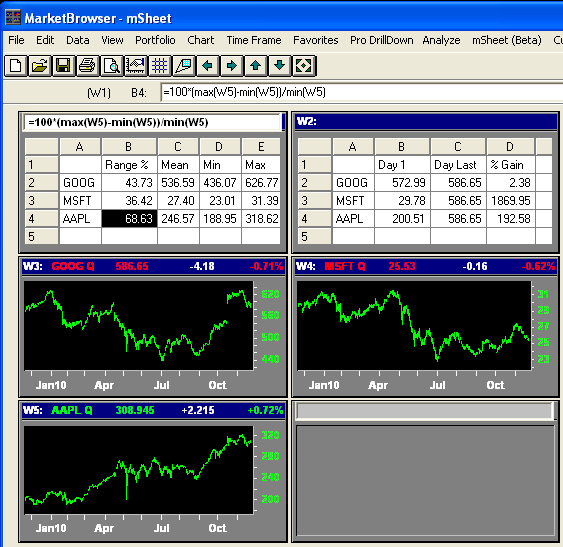 mSheet, the first spreadsheet in the world designed specifically for traders and analysts. While the MarketBrowser AE itself is a true "spreadsheet for time series", it also includes the ability to place an mSheet™— within any MarketBrowser window. What is an mSheet and what does it do which is special or different? In other words, mSheet can dynamically recompute the %range movement of AAPL as a percentage of its lowest value in Window W5, even as the high and low values in window W5 change. If we change the ticker in window W5, the mSheet in window W1 would adjust accordingly. Window W2 above contains another mSheet. Here the formulas pick off the first ("Day 1") and last values ("Day last") in several source windows, in this case, windows W3, W4 and W5, which contain GOOG, MSFT and AAPL, and in column D, the percent gain from the first day to last day is shown for each stock. This mSheet is dynamic with respect to every single new price which comes in for each of these stocks. mSheet was designed specifically for live and historical financial market data analysis— and allows you to create "smart" spreadsheets with cells which are fully aware of the market time series data you need to be on top of every day. Each mSheet cell has full "computational access" to all live and historical time series in your MarketBrowser worksheet. So go ahead, Be Omniscient when you Get MarketBrowswer AE today. mSheet embraces the familiar experience of working with a spreadsheet and alloys this powerful concept to MarketBrowser's specialized facility in dealing with dynamic and deep historical market time series data. Make these formulae dynamic and instantaneously recalculate them based on live market data feeds and you have mSheet™. mSheets make your analysis more sophisticated, while making the calculation of results vastly speedier than is possible with traditional spreadsheets. Is mSheet a replacement for my PC spreadsheet? mSheets Understand Time Series—Spreadsheets Don't That's a BIG difference - If you want to divide Microsoft's stock history by Apple's stock history, and you're missing 1 data point, a spreadsheet can generate an error. A MarketBrowser mSheet (specifically designed for time series analysis) adjusts for the missing observation and generates the result you're looking for. A Vector Spreadsheet - Cells in a traditional spreadsheet each hold a single number, but a MarketBrowser mSheet cell can hold a stock's entire 10 year transaction history. If you add the price history of a second security to cell #2 and divide, you can instantly chart the price ratio of the 2 series and how it changed over time—a feat that would take millions of cells plus customized graphs in a traditional spreadsheet. Accelerated Real-Time Recalc™ (ARTReC™) MarketBrowser mSheets perform calculations on entire vectors of data instantly. These arrays can be comingled in calculations with mSheet cells in a way that is highly convenient for the user, and optimized for speed. mSheets Are Integrated with Your Data Feed - How do you find or dynamically recalculate the mean price of a currency or stock with over 2 million trades? With mSheet it is so easy to do. Pull the instrument's history into a MarketBrowser AE chart window -- say Window 1 (W1), click on an mSheet cell and type =MEAN(W1), and the answer will be looking right at you --instantly. Need to find all the peaks above a certain price threshold? You're just a few clicks and keystrokes from the answer.